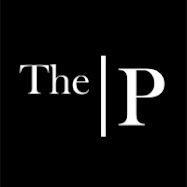 The Primitique: What do you suggest? Yesterday, I was in the dressing room at Ross, Dress for Less when I heard a lady say to her friend, "Tell me the truth." She was standing in front of the 3 way mirror checking out an outfit. I was half dressed, but almost ran to the mirrors to give my opinion. I luuurv giving my opinion! But, alas, I refrained. Besides clothes shopping, I have started redecorating my home for Christmas. I picked up this mirror at a little resale shop yesterday. Love it! Tall candlesticks? Cheap at a discount store. Gold trees? A thrift store. Stockings will be hung by the chimney with care, eventually. Look at this bigger picture of the fireplace. There is a hole under the fireplace that was built for firewood. It comes in handy. On either side of the hole, see the silver vents? The fireplace has a heat-a-lator. It helps disperse heat. It's a good thing. If you look at that first picture again, you'll see that the bricks between the two stocking trees have slits. The heat is blown from the heat-a-lator, through these slits. But now, if you will, imagine an antique mantle surround. It won't fit. It would cover the vents on the sides, and it would most likely cover the slits in the bricks. Not good. What to do? 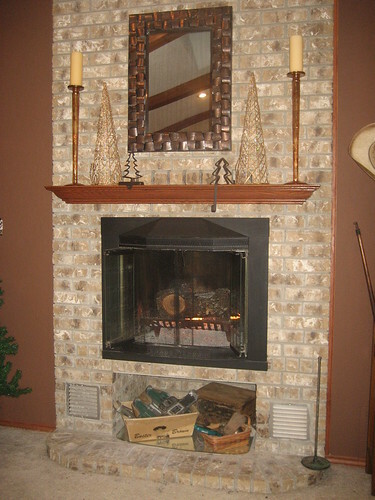 Besides the vent placement, the fireplace is high. So, it sits too high for my mantle surround, anyway. What do you think? Just find an old hunk of wood and make it into a shelf? Find an old half rotten surround and chop off the legs? Help! What do you suggest? To quote the gal in the dressing room, "Tell me the truth." I have lived with (and hated) this shelf for way too long. Maybe Santa will hook me up with your groovy suggestion. You may have noticed, I've been away from the computer quite a lot lately. I am behind on y'alls posts. I miss you. But, I am also behind on life. My home and both stores need me. It's a tug of war and life away from blogging/reading/commenting is winning the tug right now. Thank you to the newbies/lurkers who have left comments recently. I'm sure I'll be back in full force soon. Can your "handy man" create some kind of base for your antique mantle? Maybe the base could contain some of your cool junk finds for the heat outlets. I think I saw a cool old vent or register in your store. Now you just need a second one! It could be totally personalized, unique and cool! If that doesn't work, whitewash that mantle. I had a mantle similar to yours and didn't like it either. I painted it white and distressed it...much to the objections of the contractor. I love it now! 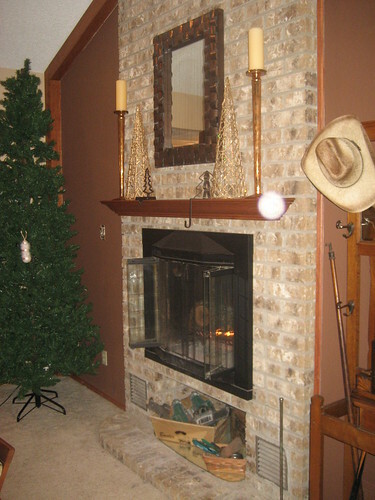 Mindy--I am posting pics tomorrow of my stockings on my mantleless fireplace that needs help. I vote for a hunk of barnwood or beam. Is your Christmas tree only going to have ONE ornament on it? Hey...it looks good, don't get me wrong. I was just asking! hahahahaha! Becky, I look forward to checking out tomorrow's post. Hmmm...I'm thinking that an old 'beam' from a barn or house would make an awesome mantle shelf on that FP. Refitting an old mantle will be difficult and if you do, you'll have to cut it up...a custom one will be pricey... :-) Tami E.
Save your self a lot of brain power and just get Fran & Liz over PDQ. Those two can take one look and tell you exactly what to do and how to do it. Me...I'd probably whitewash the brick in cream, get a porch post, cut it in half and mount it on each side above the vents. Then I would add another deeper shelf and paint it along with the posts, a distressed black. But that's just me. I'd probably put a nativity scene where the logs are supposed to be stored with some kind of lighting. Tons of real greenery, being extra careful to not start a fire ala Red.Neck Chic and call it done. Or, it would look neat to do 3 shelves.... staggered! Thick ones, like railroad ties or beams... start with the bottom one centered, middle to the left and top to the right - with about 18" in between and have lighting wired in so that your fireplace "glowed" all the way up! We'll still be here when you finally get the tug rope in your hand. I liked all the suggestions for your mantle. I am fortunate my husband is a builder... I just draw a picture and he builds it... our fireplace was made out of free lumber...we found it in a burn barrel. Broken bits of trim, so we asked for it and they gave it to us. I am sure you will find the materials and that will determine your look. Take care and you can get some rest at Shiloh! I would take a barn beam and then frame up around two window shutters (one for each side) still lets the heat out. The shutters are a great place to hang other decorations or even your multitude of Christmas Cards. (I am not PC either, it is Merry Christmas at our house, not Happy Holidays). Hope this gives you some inspiration. I'd like to see you give yourself some time and deal with work and family - take away the stocking hangers and put a long arrangement in the middle instead - perhaps a pretty crystal bowl with gold and silver glass ornaments, or Christmas greens and glass balls to draw your eyes away from all the tall items. Then the mantle will work for now unil you have time to decide what you want. Jennifer Peaceful Holidays! Mindy, this is exciting! In my opinion...take that for what it's worth...I'd get a giant beam and somehow mount it over the fireplace. Even if you can't find an old one, you can get a new one and 'antique' it. 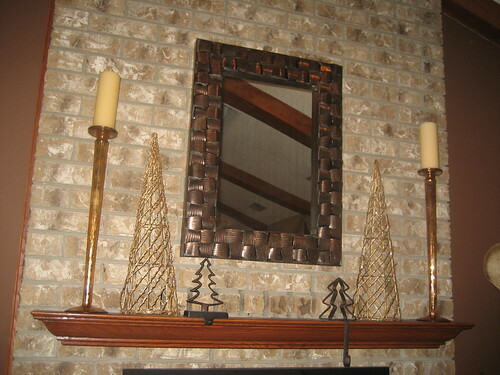 I've seen (on TV) a mantle that was beaten with chains and then stained with several different finishes. The end result was an old beam that looked amazing. Love the mirror, gold trees, and candlesticks! Ah HA! Y'all like giving advice/opinions, too! And WOW! The wheels have been turning and what an inspiration y'all are. Debbie, funny you should say that about a nativity in the hole down under. I had one under there last year, on top of a mirror that reflected the light nicely. Woo hoo! We're on the same decorating page and I'm honored. I almost just ran up to Primitiques to grab a couple metal shelf pieces that I have. They might be perfect on either side, allowing for air flow. But, I'd have to take the existing shelf down and I have nothing to take it's place yet. I'm loving the shutters on each side idea. I'm loving the round columns "supporting" the shelf idea. Both are perfect for the airflow vents. I'm seeing it all! Now it's a matter of gathering materials and making something happen. Did I say thank you? THANK YOU for running out of your dressing rooms half dressed to "tell me the truth". I so much appreciate y'all taking the time to share your ideas. As for painting the brick...probably not willing to go there. I can see the possibilities, but I'm not ready to commit. Kinda like a tattoo...it seems so permanent! Now. I have got to do some Christmas decorating. My sister told me I have to finish decorating and THEN I can tackle the mantle issue. That should get me in gear, huh? I want to tackle the mantle now! ugh. It's too late for me to form an original thought, so I'm going to have to vote for either Debbie or Robelyn's ideas. Everybody came up with some excellent suggestions, but there's just sorta spoke to me. I'd like to comment on the other part of your post, the part where you're feeling exactly what I've been feeling...I've heard so many of us apologize for not making the rounds on everyone's blogs, but really, I think we should all get a free pass this time of year! Family and home must come first, and if you go a few days or weeks without visiting me, I'll survive! I'll miss ya, but I'll be fine, and I'll sure be here when ya get back. Okay...time for me to put in my two cents. I think you should get David to build you a bench or just find one and put it along the bottom in front of the log hole and vents. That way they won't be covered up and they can still get the heat through the house and you could still put things in the hole, it would just be underneath the bench. And you could even sit on the bench by the fire to get warm. 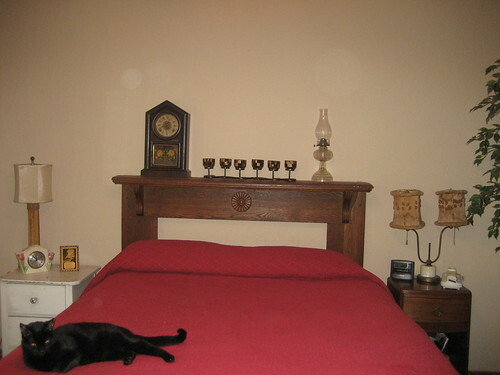 Then maybe your headboard mantle wouldn't have to reach the floor because of the bench. Can you see it? Or you could just find scrap wood or columns and put them on the sides and then find a big old piece of wood across the top for the mantle! Wow! Did you understand any of that? I'm not sure I even did! LOL! Anyway, don't sweat not getting around to the blogs...we are all facing that right now! Have fun decorating! I tell you what, y'alls ideas just keep coming and they are so good! Adrienne, the bench idea is intriguing. I like it. Again, thanks everyone! This is so much fun! And while I think of myself as pretty snappy, I was at a loss on this one. Love your whole mantel decor. And that woven metal mirror. Super cool! Such a neat blend of textures and colors and patinas. Nice style over there in Poetry, Texas. I would also agree with many of the above comments. Build up the bottom of a vintage surround and add framed out screening of some sort. I know you can find something metal and full of holes! Just build boxes with the framed screening on the front to sit the mantle up on. Then I would go even higher by topping the mantle with posts and a back piece with a shelf above and a framed out mirror in the center. Drama baby! Kind of like the old huge Victorian surrounds but more modern and rustic. Anyhoo, it is hard visiting all the blogs this time of year. I think we will all be back into it in January, when the winter doldrums creep in. Post what you decide to do. Can't wait to see it!